I love Hogarth, too. Ha, ha. Beer Street? Is there really such a place? National pastime? Time for a new one! Ack! That picture is freaky. 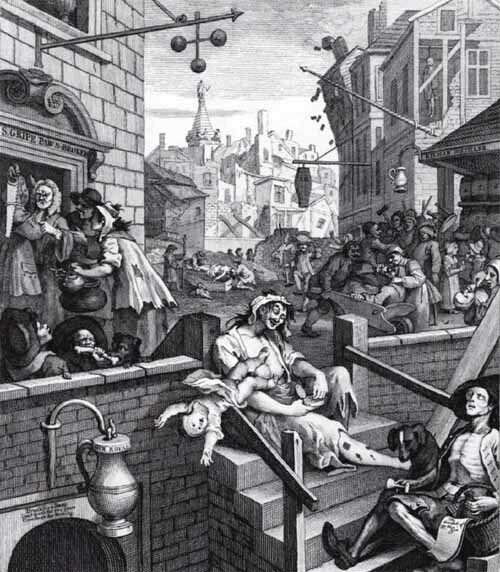 The gin problem in 18th C England was bad, really bad. The makers put stuff in the gin that made people go crazy, plus it was cheap, so the poor were the losers all round. Looks worse than a crack neighborhood, to me. How did I ever miss that one! Thanks, Rowenna. I'm off to Beer Street for sure. Everybody's not only happy, but fat and in love.